2 Representatives of Civil Society Organizations on rotation and nominated through a selection process by Civil Society Organization’s (CSOs) working for children in SAARC. 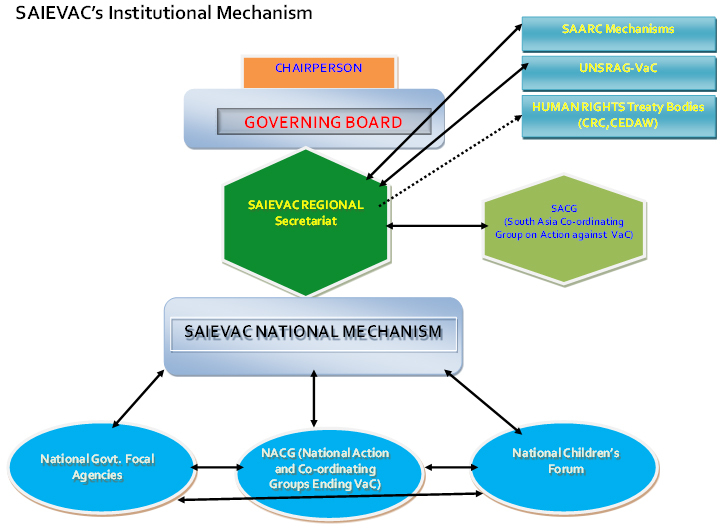 The Governing Board reviews, approves and facilitates SAIEVAC processes and operations that ensure protection of children against violence in the region such as policies, legislatives, frameworks and programme interventions in line with SAARC and international instruments. The Governing Board also supervises the functions of the SAIEVAC Mechanism while approving workplans and budget. Children are part of the Governing board after being selected from their peers at the national and regional level in a fair and representational manner .Children representatives at the regional level represent the views and feedback from other children connected to the SAIEVAC structure such as Children part of National Forums who are responsible for presenting children outlook on protection issues in their country. The Regional Children’s Forum acts as a place where children from across the region can come together and make recommendations to the SAIEVAC Secretariat and Board. This ensures their continued participation at both regional and national level. Civil Society representation on the Board is meant to enrich the Governing Board decision making processes by offering ground level experience of violence issues and successful implementations to combat violence. CSOs will provide SAIEVAC meetings with technical support while sharing their experiences in order to ensure governments understand the reality on the ground. They will also be able to form linkages with government officials and children in order to have a larger impact at the national level. SAIEVAC’s Regional Secretariat is based in Nepal and supports the implementation, monitoring and evaluation of the workplan approved by the Board. The Secretariat also assists country level initiatives, technical meetings and cross country learning and additionally reviews policies, legislative frameworks, and programme interventions within the framework of SAARC and international conventions and agreements. Board of Governors and National Coordinators from member countries are jointly responsible for implementing a National Mechanism such as coordinating activities, implementing the workplan and mobilizing resources for ending violence against children throughout the region. 1 National SAIEVAC Coordinator, responsible for coordinating national level activities and who also acts as the focal point for SAIEVAC Regional Level activities. Responsibilities need to be spread across government agencies, with services delivered by national and local authorities, non-State providers, and community groups, making coordination between sectors and levels. Strengthening such systems requires attention to policy reform, institutional capacity development, planning, budgeting, monitoring and information systems. In this regard, SAIEVAC member countries support the meaningful and active participation of civil society, children, and young people so that they can prevent and monitor violence against children, make recommendations to end violence against children and be involved in decision-making processes for actions to end violence against children.